Which of the following statements comparing position, distance, and displacement is correct? An object may record a distance of zero while recording a non-zero displacement. An object may record a non-zero distance while recording a displacement of zero. An object may record a non-zero distance while maintaining a position of zero. An object may record a non-zero displacement while maintaining a position of zero. This is College Physics Answers with Shaun Dychko. Which of the following statements comparing position, distance, and displacement is correct? Well, let's consider option A: An object may record a distance of zero while recording a non-zero displacement. That isn't going to happen because if an object starts in one position and then goes to a different position in which case it has a displacement because it ends at a different location than it started, then it must also cover some distance 'cause displacement always has some magnitude, and there is a path being traveled here and that path has some length and so there is a distance traveled if there is ever a displacement for sure. 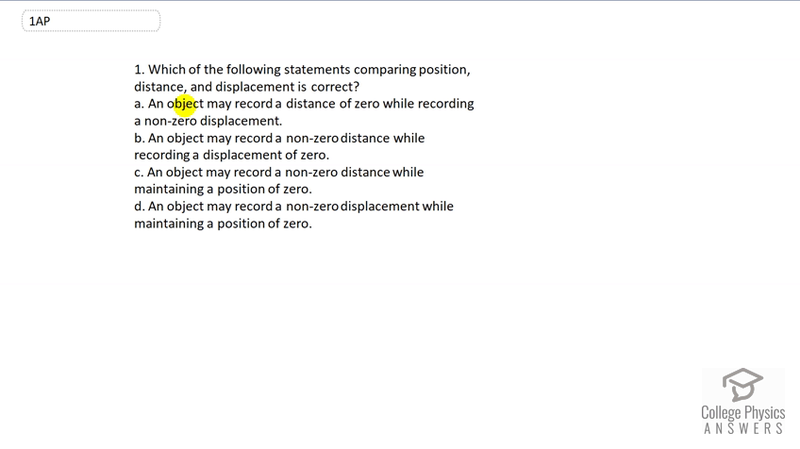 Now, consider part B: An object may record a non-zero distance while recording a displacement of zero. And this is the answer to our question. This is possible because it's possible to start at your original position that equals position A, and travel some distance and then return back to your original position and in this case, displacement would be zero because the final position and the initial position are in the same place. But there is some path traveled here and so there is some distance traveled and so that's what it means by non-zero distance. It means there is a number bigger than zero to indicate the distance traveled and yes, that's possible given a displacement of zero. C and D are not possible. I guess, let's consider them. Let's consider C: An object may record a non-zero distance while maintaining a position of zero. No, because if it's going to maintain a position of zero that means it can't move because it's maintaining it's position. If it can't move from here, then it can't travel any path. And so there's no distance possible. So it can't be C. It can't be A, and D: An object may record a non-zero displacement while maintaining a position of zero. That's a contradiction of terms because displacement means the object is in a different position. So if it's maintaining a certain position you can't have a change of position. So that doesn't work.